Hawaii is like no other place on earth. Be mesmerised by its natural beauty with cascading waterfalls, lush rainforest, tranquil beaches and magnificent volcanoes. There are six unique islands to explore, each with its own distinct personality and offering its own adventures that will entice any traveller. The warmth of Hawaii's people wonderfully complements the Islands' perfect temperatures. Kailua is a census-designated place (CDP) in Hawaiʻi County, Hawaii, United States, in the North Kona District of the Island of Hawaiʻi. The population was 11,975 at the 2010 census. It is the center of commerce and of the tourist industry on West Hawaiʻi. Its post office is designated Kailua-Kona to differentiate it from the larger Kailua located on windward Oʻahu, and it is sometimes referred to as Kona in everyday speech. The city is served by Kona International Airport, located just to the north in the adjacent Kalaoa CDP. Kailua-Kona was the closest major settlement to the epicenter of the 2006 Hawaiʻi Earthquake. Kahului is a census-designated place (CDP) in Maui County, on the island of Maui, in the U.S. state of Hawaii. Kahului hosts Maui's main airport (Kahului Airport), deep-draft harbor, light industrial areas, and commercial shopping centers. The population was 26,337 at the 2010 census. Kahului is the retail center for Maui residents and there are several malls and major stores (including department stores in the Queen Kaahumanu Center); other significant groupings of stores are in Lāhainā such as the Lahaina Cannery Mall, the Happy Valley area of Wailuku, Maui Market Place and Maui Mall, which are both also located in Kahului, and The Shops at Wailea in Wailea. Kahului is not generally considered a tourist destination but does feature the Alexander and Baldwin Sugar Museum, Kanaha Pond State Wildlife Sanctuary, Kanaha Beach County Park, and the Maui Arts and Cultural Center. Home to nearly half a million people, Honolulu is Hawaii's state capital and only major city. The city of Honolulu and the island of Oahu offer a wealth of historic, cultural and scenic attractions. Waikiki Beach and Diamond Head are two of the city's enduring symbols. Pearl Harbor, site of the USS Arizona Memorial and the "Punchbowl," are haunting reminders of the tragic events of December 7, 1941, when the Japanese surprise attack on Pearl Harbor forced America into World War II. Honolulu is also home to the historic Iolani Palace, the official residence of Hawaii's last royals. Beyond the city lie tropical rain forests, the Pali Lookout and the North Shore known for its surfing beaches. A draw card to visitors of all ages, from all corners of the globe, Honolulu's appeal ranges from it's magnificent beaches, countless well-stocked shops, tempting restaurants and a multitude of historic, cultural and scenic attractions. The fourth largest island in the Hawaiian group, Kauai is known as the 'Garden Island' The terrain ranges from the volcanic slopes of Mt. Waialeale and the desert-like beauty of Waimea Canyon to the Wailua River's lush Fern Grotto. Ironically this once isolated island was the site of the first meeting between Europeans and Hawaiians. On January 19, 1778, Captain James Cook anchored his ships off the mouth of the Waimea River, becoming the first in a long line of enthusiastic visitors. Kauai was never conquered by the great warrior King Kamehameha. Maui has always occupied a special place in the hearts of Hawaiians. The great warrior King Kamehameha, who united the islands under his rule, chose to make Lahaina his capital and Ka'anapali was once the favorite playground of Hawaiian royalty. And no wonder - Maui boasts stunning landscapes and superb beaches. Mt. Haleakala, a dormant volcano, rises 10,000 feet above the Pacific Ocean. Once hailed as "The Valley of the Kings," Maui's Iao Valley is a tropical paradise dominated by the Needle, a volcanic monolith towering over the valley floor. Then there is Lahaina, once home to a royal court and a raucous port-of-call enjoyed by 19th-century Yankee whalers. Haleakala means "The House of the Sun." To the Hawaiians, it appeared that the sun both rose from and set in the depths of its massive crater. Today, the centerpiece of Haleakala National Park, it is one of Maui's major attractions. Note: Lahaina is an anchorage port. Transportation from ship to shore is via the ship's tender service. Tahiti is not just an island - Tahiti has always been a state of mind. The bustling capital of Tahiti and her islands, Papeete is the chief port and trading center, as well as a provocative temptress luring people to her shores. Immortalized in the novel "Mutiny on the Bounty," who could blame the men of "HMS Bounty" for abandoning their ship in favor of basking in paradise? And what would Modern Art be without Tahiti's influence on Gauguin and Matisse? 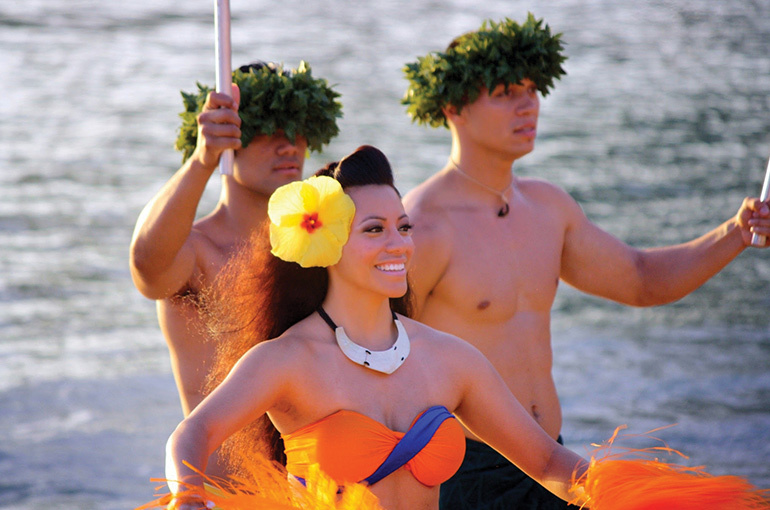 Today the island is a charming blend of Polynesian "joie de vivre" and Gallic sophistication. But venture out from Papeete and you find a landscape of rugged mountains, lush rainforests, cascading waterfalls and deserted beaches. Contrasting with other French Polynesian ports, Papeete's coastline initially greets you with a vista of commercial activity that graciously gives way to both black and white-sand beaches, villages, resorts and historic landmarks. To discover the storied Polynesia of Melville, Gauguin and Michener, you have to travel to Tahiti's outer islands. Moorea, the former haunt of Tahitian royalty, is one such island where you still see fishermen paddling outrigger canoes, pareo-clad women strolling along the roads and children fishing from island bridges. Moorea is an island of vertiginous mountains - most of its 18,000 people live along the narrow coastal shelf. Behind tin-roofed wooden houses lie lush green mountains rushing up to fill the sky. French Polynesia comprises some 130 islands, of which Tahiti is the best known. Just 12 miles across the lagoon from Tahiti lies Moorea. Note: Moorea is a tender port. Transportation from ship to shore will be via the ship's tender service. Majestic mountains sculpted by ancient volcanoes, a shimmering lagoon and a barrier reef dotted with tiny motu, or islets - welcome to Bora Bora, perhaps the most stunning island in the South Pacific. Only 4,600 people live a seemingly idyllic lifestyle in the main villages of Vaitape, Anau and Faanui. No wonder those generations of travelers - including novelist James Michener - regarded Bora Bora as an earthly paradise. Connected to its sister islands by water and by air - the landing strip sits atop Motu Mute, one of the reef's islets - Bora Bora remains relatively unspoiled by the modern world. Note: Bora Bora is an anchorage port. Transportation from the ship to shore will be via the ship's tender service. 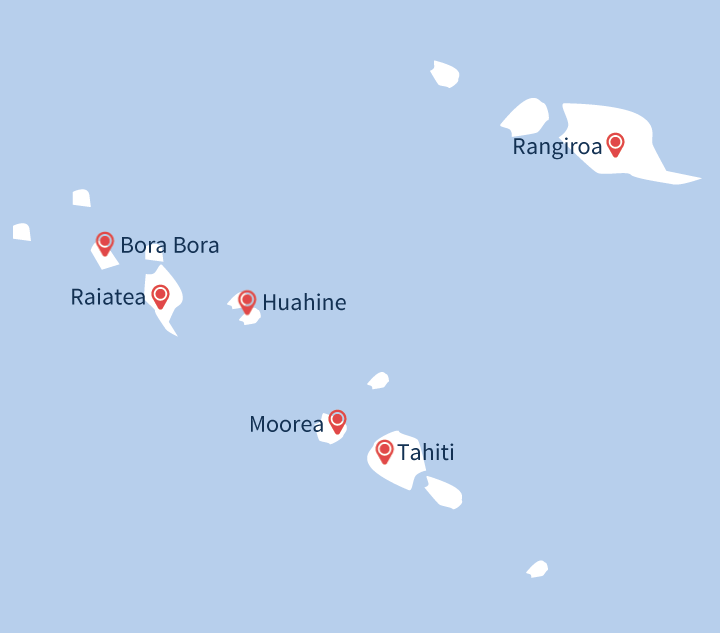 Considered the second largest island in French Polynesia, Raiatea is situated approximately 120 miles northwest of Tahiti. For the Polynesian "Maohi," ancestor of today's Tahitian, Raiatea was known as "Sacred Havai'i" and was the center of royalty, religion, culture and history. The principal village is Uturoa, with a population of over 10,000. This bustling port town features a colorful market and arts and crafts shops along the waterfront. Raiatea is currently undergoing a renaissance, with special attention being given to preserve the island's rich culture and heritage. Raiatea's importance as both a religious and historical center for all of Polynesia is complemented by a wealth of archaelogical sites, tropical scenery and reef fringed lagoons. One of Polynesia's best-kept secrets - Huahine, the "Wild Island" in the Society Islands - lies just over a hundred miles from Tahiti. The two islands of Huahine, Huahine Nui and Huahine Iti (Big Island and Little Island), are surrounded by a deep lagoon encircled by a coral necklace. Connected by a bridge, both islands boast white-sand beaches, vanilla plantations, friendly and easy-going islanders, and some of Polynesia's most significant cultural sites. Note: Huahine is a tender port. Transportation from the ship to shore will be via the ship's tender service. Rangiroa, meaning "huge sky," is the largest atoll of Tahiti and her islands, and one of the four largest in the world. It has more than 240 motu (islets) separated by more than 100 "hoa," small channels that make up its ring of coral, and in the center of the inside lagoon is the Paio Motu. Discover this long ribbon of islets located in the middle of the Pacific Ocean and marvel at the incomparable brilliant colors of the lagoon. Rangiroa features a palm-fringed coast and warm, blue tropical waters. The ship's tender will drop you off at the pier, affording you the opportunity to stroll the coastal road or do a bit of beachcombing. Rangiroa is famous for its surrounding coral reef and marine life. Be sure to spend at least part of the day enjoying the ocean in this very unique and rarely visited coral atoll. Note: Rangiroa is a tender port. Transportation from the ship to shore will be via the ship's tender service. Pago Pago Bay is one of the most dramatic harbors in the South Pacific, a region known for dramatic landscapes. Eons ago, the massive seaward wall of a volcano collapsed and the sea poured in. Today, dramatic mountain peaks encircle the deep harbor. The capital of American Samoa, Pago Pago is more village than city. The town is dominated by looming Mt. Pioa, whose summit draws moisture-bearing clouds, earning it the nickname of "The Rainmaker." Indeed, Pago Pago draws more than its fair share of rain - the island of Tutuila is a vision of deep, verdant green. Pronounced "Pango Pango," this island paradise awaits exploration.